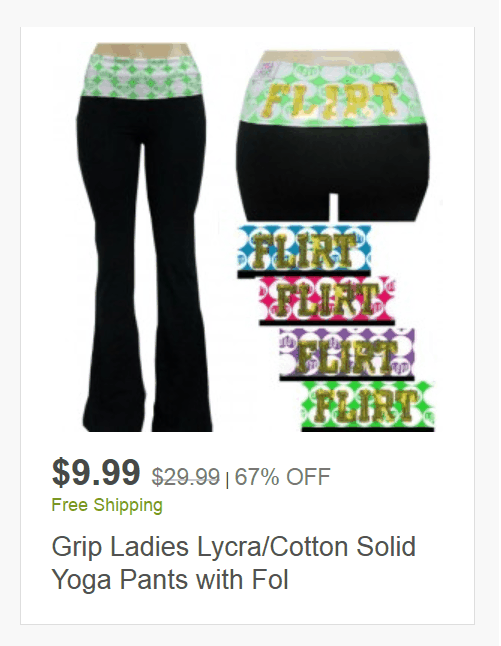 Grip Ladies Lycra/Cotton Solid Yoga Pants with Fold-Over Waistband & Flirt Sequins ONLY $9.99 + FREE Shipping (WAS $30)! You are here: Home / Great Deals / Grip Ladies Lycra/Cotton Solid Yoga Pants with Fold-Over Waistband & Flirt Sequins ONLY $9.99 + FREE Shipping (WAS $30)! I just ordered a pair of these (you can never have too many yoga pants)! Grab a pair or two of these Grip Ladies Lycra/Cotton Solid Yoga Pants with Fold-Over Waistband & Flirt Sequins for ONLY $9.99 + FREE Shipping (WAS $30)!